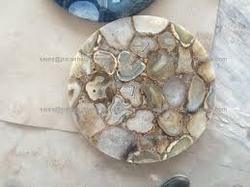 As a leading business organization, we have been engrossed in offering a wide variety of Ring Ceremony Mirror Platter. We offer an extensive range Small Ring Tray that is available in variety of ranges for our clients. These products are mostly used in marriage ceremonies and other occasions. This range is made with durable material which provides a long lasting service to our customers. The cost of our products is very much affordable. Designer Ring Ceremony Platter by RG Creations. Dimension: Length - 10", Breadth - 10"
HANDMADE DECORATIVE ENGAGEMENT PLATTER. AMDE AS PER REUIREMNT AND BUDGET. MANY MORE DESIGN AND PATTERNS. This is a hand crafted Engagement Ring Tray with beautiful flower and statues that makes antique look of this ring platter. This is used for wedding ring ceremony. 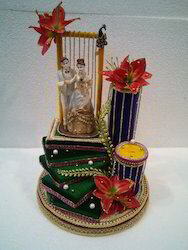 we are designer and supplier of such type of gifts.